The five Cassidy children from Co Wexford are Ireland’s first surviving quintuplets and now 11 years old; Conor, Cian, Rory, Amy, and Dearbhail are in fifth class and live with mom and dad Veronica and Kevin. From March 1, Renault Ireland started to give all of their new passenger car and light commercial vehicle buyers a five year unlimited mileage warranty. This is the first and only car manufacturer in Ireland to have this offering. 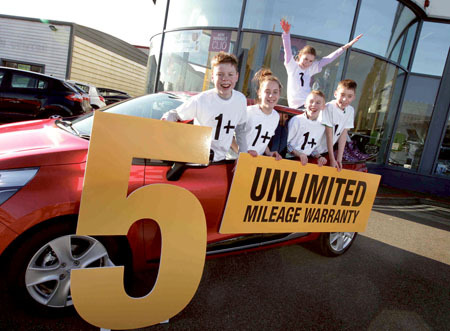 The five year unlimited mileage warranty from Renault is just that, unlimited. Whether a private or commercial customer, taxi or hire drive vehicle, the mileage is unlimited and will give customers peace of mind and reassurance when ordering a new car or van from the new Renault range. It was high fives all round today when Ireland’s only quintuplets were on hand to announce that Renault will be the first manufacturer to offer a five year unlimited mileage warranty across its full range of passenger cars and vans. As usual, terms and conditions always apply to such an offering. Chief among these will be that the warranty cover is dependent upon vehicles adhering to the manufacturer’s recommended servicing schedule. Also, service items and normal wear and tear are excluded. Other manufacturers may offer five or more years warranties however there are some exclusions and restrictions. The five year unlimited mileage warranty from Renault includes: breakdown assistance for five years; all warranty repairs carried out by trained Renault technicians using genuine Renault parts; no limit on the number of repairs under the term of the warranty; covers the cost of repairs due to component failure as a result of a manufacturing defect; and warranty is transferable to a second owner if the car is sold during the term, enhancing the residual value of the vehicle. Currently the only manufacturer to offer a five year unlimited mileage warranty across its LCV range, Renault is now the only manufacturer in Ireland to offer this five year unlimited mileage warranty across its entire range of passenger cars and vans, a huge incentive for both private and business customers looking to order a new 2013 vehicle.